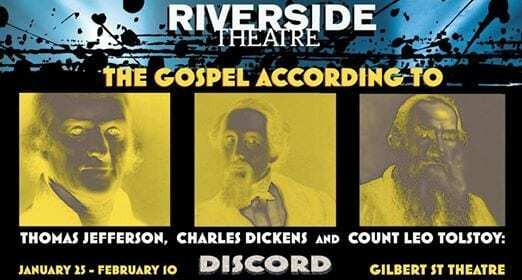 The Gospel According to Thomas Jefferson, Charles Dickens and Count Leo Tolstoy: Discord, written by Scott Carter, and directed by Adam Knight runs January 25 – February 10, 2019 at Riverside Theatre. This whip-smart comedy, from the Executive Producer of HBO’s “Real Time with Bill Maher”, sets three of the world’s greatest thinkers against each other in a battle of wits and wills. Each a genius of their age, Jefferson, Dickens, and Tolstoy find themselves locked in a room together with no exit. To escape they must ransack the philosophies of their lives and work, searching for a truth that will set them free. Coming with a Pack? Call the Box Office at (319) 338-7672 to learn about discounts for parties of 10+.